Learning Resources Create-a-Maze Just $6! Down From $30! You are here: Home / Great Deals / Christmas Deals / Learning Resources Create-a-Maze Just $6! Down From $30! Amazon has this Learning Resources Create-a-Maze on sale for $6 (Reg. $30)! 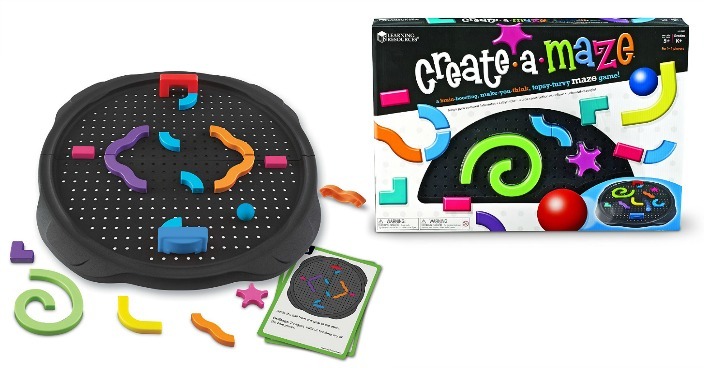 Create-a-Maze is an ever-changing maze that challenges the mind and strengthens both creative and critical thinking skills. Activity Cards guide beginners to follow visual instructions with specific piece placement. Once mastered, children place pieces independently and develop strategies and spacial reasoning by tilting the rocker board and moving the ball through the maze and towards the goal. The more complex the path, the more perseverance and creativity is needed to solve. This mental workout incorporates strategic planning, analysis, creativity and continual trial and error. The constant reassessment of proper piece placement sharpens children’s ability to look at a problem from different angles and devise solutions. Kids can’t keep their hands off the colorful, curvy pieces and the mental manipulation encourages out-of-the-box thinking and independent problem solving. For one to four players. Grades: Kindergarten+.